Create, Preview & Print advanced Barcode Thermal Labels with VB.NET, C# & ASP.NET without efforts! Zebra is a registered trademark of ZIH Corp. Intermec is a registered trademark of Honeywell International Inc. ThermalLabel SDK for .NET is NOT made by or endorsed by Zebra nor Honeywell. ThermalLabel SDK can be used for designing and printing from simple to complex labels layout supporting Texts, Barcodes, Graphics and Images, RFID Tags, and Shapes like circles, ellipses, rectangles, and lines. It provides an unified object model which will allow you to create one label design and print it to either Zebra & Honeywell-Intermec printers getting the same output printing! ThermalLabel SDK was built as a .NET Standard Library which allows it to be used in any project targeting .NET Framework, .NET CORE, Legacy ASP.NET MVC & CORE, Xamarin, Mono & Universal Windows Platform (UWP) platforms. ThermalLabel SDK provides .NET label design and printing for any Zebra-compatible Thermal Printers supporting ZPL® or ZPL II® (Zebra Programming Language) or EPL (Eltron Programming Language) as well as Honeywell-Intermec printers supporting Fingerprint® commands. ThermalLabel SDK provides a flexible programming object model that allows you to create one label design and print it to either ZPL, EPL & Fingerprint printers getting the same output printing! ThermalLabel SDK will let you to create from simple to complex layouts without efforts writing pure .NET code in VB or C#. ThermalLabel SDK generates native ZPL, EPL & Fingerprint commands. Printing job is fast and you get best performance. ThermalLabel SDK was designed considering .NET Data Binding scenarios which mean you can bind text and barcode items to .NET data sources. It provides support for most common data types used in data binding scenarios like Arrays, Lists, ADO.NET Access or SQL Server DB, XML DataSet, Custom Objects as well as CSV files! Counters allow you to index data items by a selected increment or decrement value, making the data items increase or decrease by a specified value each time a label is printed. 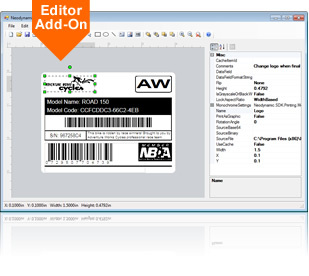 Learn how to print 10 barcode labels for values ranging from "ABC01" to "ABC10" leveraging Counters feature! Text items supporting multi-line, content alignment, sizing, Unicode, RTL (Hebrew, Arabic, etc. ), Custom and installed Windows TTF files, White Text On Black, rotation, horizontal alignment, counters, and text masking. Graphic, Image & Picture items supporting image formats like GIF, JPG/JPEG, BMP, and PNG; monochrome conversion features like Threshold and Floyd-Steinberg algorithms and reversing; sources image like files, base64 as well as binary content. Shape items supporting lines (horizontal, vertical, and diagonals), rectangles with rounded corners, circles and ellipses. Our barcode algorithms were written by following the official specifications of each barcode symbology. Our barcode engine within ThermalLabel SDK provides you with exclusive features like auto-checksum, data validation, Bar Width Adjustment (BWA) for linear & 2D symbols, auto-encoding methods for shortest barcode symbol generation. ThermalLabel SDK handles label designs in a plain & simple XML-based format. By invoking a simple class method you can get a string representation of the thermal label in XML format allowing you to save or store it in any kind of data source be it SQL Server Database, file on disk, memory stream, etc. In the same way, you can restore or open the thermal label definition from a XML Template by just invoking a simple class method as well. Most Thermal Printers do not support Print Orientation feature. ThermalLabel SDK fills that gap by providing you Portrait and Landscape print orientation with 90, 180 & 270 degrees rotation! A built-in mechanism for printing on media rolls featuring more than one single label per row (a.k.a. multi-column printing support) is also missing in most thermal printers. ThermalLabel SDK provides this feature out-of-the-box allowing you to print any number of labels per row! Design labels from Windows, Linux, Mac & Android! 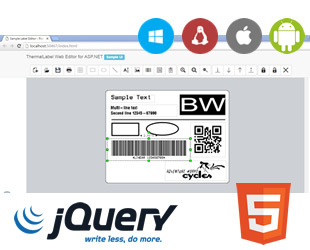 ThermalLabel Web Editor Add-on is a first-class barcode label designer component for ASP.NET websites (MVC & WebForms as well as CORE Edition) which empowers your WebApps by providing an end-user visual label editor! With the ThermalLabel Web Editor component, you can allow your end-users to create, load, edit and save ThermalLabel objects in the form of XML template file definition from Windows, Linux, Mac & Android Clients with latest browsers! Empower your .NET Windows Apps with the ThermalLabel Visual Editor Add-on! ThermalLabel Editor Add-on is a first-class barcode label designer component for .NET Windows desktop apps (WinForms & WPF) which empowers your own apps by providing an end-user visual label editor! With the ThermalLabel Editor component, you can allow your end-users to create, load, edit and save ThermalLabel objects in the form of XML template file definition or .NET object within your own .NET apps. Develop without having a physical Thermal Printer! ThermalLabel SDK allows you to preview and export/save the output label content to most popular raster image formats (JPEG & PNG), vector image format (SVG) as well as Adobe PDF documents. This allows you to work on your .NET developments without the need of having a physical thermal printer for testing! Easy as 1, 2, 3! (1) Just add a reference to ThermalLabel SDK dll assemblies, (2) instantiate it in your preferred .NET language like VB.NET and C#, (3) create & set up thermal label & items properties and that's it! XCOPY deploy the ThermalLabel SDK dll bundled with your exe app or dll project. With the new WebPrintJob class and the TLClientPrint utility, now is possible to print barcode thermal labels from your ASP.NET website to client-side printers! We have designed a clean and simple solution leveraging the client machine processing power. It is a cross-browser solution on Windows OS i.e. it works with any browser: Internet Explorer 6.0+, Firefox 2.0+, Chrome 11+, Opera 9.0+ and Safari 3.0+!